The August 20th workday at Old Kingsbury Aerodrome was hot, hot, hot… but we once again enjoyed a good turn-out of volunteers and made real progress on several projects. Volunteers had researched the process of rigging the Canuck in the archives and were finally ready to begin the process. Crew on the Canuck was primarily	Dave Edgerly, Billy Cheshire, Mike McCormick and Dave Orloff with a lot of assistance from Steve Freeman and limited assistance from "others". The crew got more than halfway through the procedure and several folks have commented that the airplane just looked a whole lot more airworthy, with one pundit claiming the Canuck now looks "quite jaunty"! Tasks remaining to be done are to set the angle of incidence on the wings, double-check a few measurements and safety-wire everything securely. The optimists are hoping for a test flight towards the end of the next workday! By the way - the EAA has an on-line PC wallpaper calendar and the selection for September is a photo taken by Jo Hunter of the Museum's Canuck during the Spring Air Fair! Congratulations to Jo for having her photo selected! Fokker Dr.I Triplane - Late in the day the volunteers got the Triplane rotary engine to run again! Dave and Cameron Whitaker worked on the magneto, set it, and retimed the ignition during reinstallation on the engine. Cameron stated the mag had been two gear teeth off! Attempts were made to start the engine and it fired off fairly easily but never seemed to run for very long… mainly seemed like it was running the prime only (i.e., fuel injected into the cylinders through the exhaust valve as part of the engine starting procedure). What the heck?? We've never had a fuel delivery problem with this aircraft before! Investigation revealed that the fuel tank was actually dry as a bone! Well, that explains a lot! Ian Whitaker sat in the cockpit during the starting attempts and made an important discovery - castor oil spray makes for a great hair gel! The stuff sets up and makes your hair wind-proof, and bulletproof! Look for additional engine runs the next workday when we have an opportunity to put fuel in the tank! Return to flight can't be too far off! Tom Miller, Kevin Monahan, Steve Freeman, Sam Miller, Stephanie Miller, and Dave Miller all worked on various components of the Thomas-Morse projects. The main gear on T-2 was removed from the fuselage, cleaned up, prepped and painted. T-1's gear was also painted. A little paint work remains to be done next workday, but both units are nearing completion and are nearing reassembly. The turtledecks and T-2's belly form were cleaned and inspected, but had to be wrapped back up in plastic for varnishing next workday as the epoxy varnish is on back order! On the next workday, if the varnish is there, it will be a varnish-fest (complete with oompah music and beer?) as the turtledecks, belly forms, and wood spreader bars of the main gear for both Tommies get epoxy varnished. 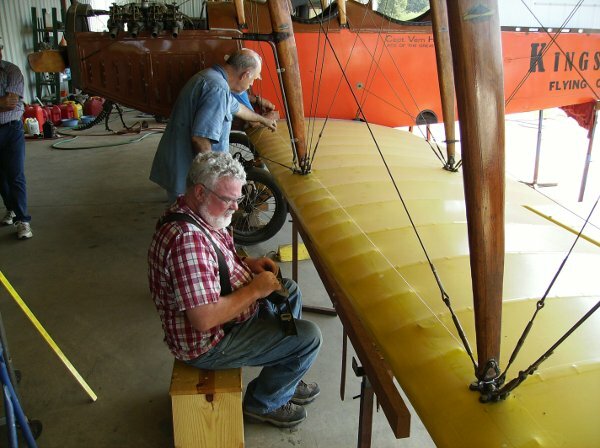 It'll also be time to re-attach / repair / re-manufacture the wood strips on the fuselage longerons that keep the fabric covering from rubbing on the bolt heads! John Bush and Lynn Howell (and Killer?) worked on the Model T wrecker adjusting the belt. John also installed bolts where some wires had been on the transmission housing driveshaft connection which should reduce oil leakage. Cameron Whitaker started disassembly of the TT's engine, and was assisted by Lynn after Lynn finished tinkering with the Wrecker. The two of them got the motor apart and determined that new pistons are needed. Al Sumrall is sourcing replacement pistons and hopefully the rebuild can be completed over the next workday or two. Cameron Whitaker also took the Model T US Ambulance's starter for rebuild and that overhauled unit should be ready for reinstallation next workday. As usual Team Vehicles also charged up batteries and exercised as many of the vehicles as they could get running around the property!